Publishers and advertisers both have different wants and needs when it comes to advertising. Publishers are looking to increase revenues and maximising their fill rates, while advertisers are looking for excellent targeting and high-quality traffic. Native advertising is the format that provides these benefits. How does native advertising achieve this? Native ads are paid media that blend into a publisher’s content on their site. ExoClick’s native ad format works on the CPC model. Native ads are clearly marked as sponsored content, so the user isn’t being tricked into clicking on the content, but because native ads are adapted to the style and layout of the website, they are more visually appealing. Additionally they do not interrupt the user experience like an animated banner ad would, so if the native ad is relevant to the user, they are much more likely to click through because the format offers the viewer much less resistance than a traditional banner advertisement would. The biggest advantage native ads give to publishers is the amount of control they can maintain over their site’s content. Banner ads don’t really allow the publisher a lot of control over what is shown, unless, like on ExoClick’s platform, they can block certain products showing in their ad zones. But native ads put the publisher in control because they can design the native ad zone to look exactly like their site. ExoClick’s native ad format allows publishers several customizable features including font type, size, color, bold and underline, background color, image border size, border color, etc. This way publishers don’t have to compromise their layout in order to monetize their content. Native advertising works across all devices because the format is mobile responsive, so consumers can experience it on desktop, mobile and tablet when they are browsing a site. It is recommended that publishers name their native ad zone with a title because in order to succeed with native advertising a publisher needs to be transparent with the consumer, so common titles are ‘Sponsored content’, ‘You may also like’,’ More from around the web’, etc. This way your consumer is aware and not fooled that it is advertising. According to www.mediapost.com consumers interact with native ads 20% to 60% more than they do with standard banner ads. In order to get the maximum CTR, advertisers have the following tools available to make their native ad compelling: a title, an image and a short description. Your native ad needs to appear like another story or article that would appear on the website you are targeting. Make sure the text for your title fits in with the site’s editorial, also do the same with your short description, never make your texts sales orientated. Your image should be simple, with no animation, logos, branding, watermarks, CTA buttons or text. Match the image with the title and description. This will guarantee you a much higher CTR. So once a user has clicked on your native ad, again you need to engage them, therefore it is highly recommended that your landing page should provide some form of content, being text, pictures or videos. We recommend that your marketing should be in the form of an article or tutorial. Native advertising brings great results when the story comes before the promotional part. Don’t say how amazing your product is or what type of superb services you offer. Tell a story first, use the page as a tool to educate the consumer about your product or service, provide customer testimonials, if it is a live cam product try interviews with some of the models. Deliver the story first and put your call to action right down at the bottom of the landing page. By making the landing page more lifestyle orientated you will increase your conversions because you are engaging the consumer. Advertisers are always going to be looking for new, less-intrusive ways to put their offers in front of potential customers, and publishers will always seek out the best ways to monetize their websites. Right now, native ads are satisfying the needs of both sides, allowing both publishers and advertisers to have great success. Now read on and see how to implement/use ExoClick’s native ad format, followed by some tips. Try uploading 10 different images, ExoClick’s ad server will optimise them based on the best CTR. Your image size should be 300×300, our system automatically resizes them to match the size of the publisher site’s images. Use ExoClick’s targeting features to fine tune your reach. 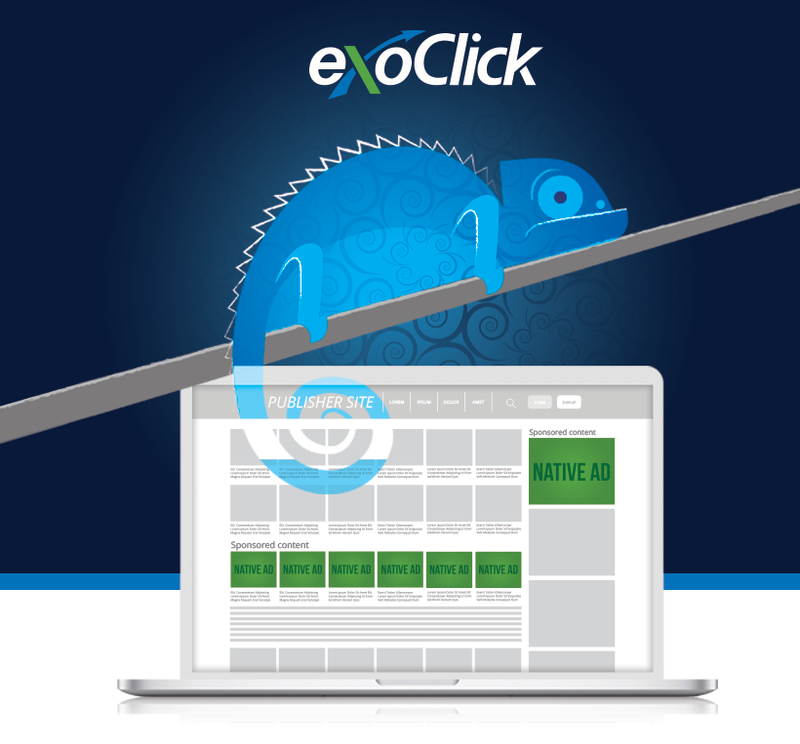 Use ExoClick’s ‘Offers’ feature to test different landing pages and optimise traffic distribution. Native ads help to avoid banner over saturation, so test native ads against your banner spots, you may find you will earn much higher revenues replacing them with our native ad widget. All tags generated are HTTPS for the security of your users.